More than 350 primary school children from across the Doncaster region took part in the EFL Kids Cup on Friday January 25, with Kirk Sandall Juniors and Norton coming back to play the final at the Keepmoat Stadium for a place in the regional finals. The six-a-side tournament, which took place at the Keepmoat Stadium, was made up of 39 primary school teams from 34 schools throughout the Doncaster, Selby and Retford region. The teams competed in mini groups, facing each team once, with the top two teams from each group advancing to the last-16. A competitive knockout stage, which saw over five penalty shootouts take place, dwindled the teams down to only two. Semi-final winners Kirk Sandall Juniors and Norton have been invited back to partake in the final before Doncaster Rovers’ league match against Peterborough United on Saturday February 9. 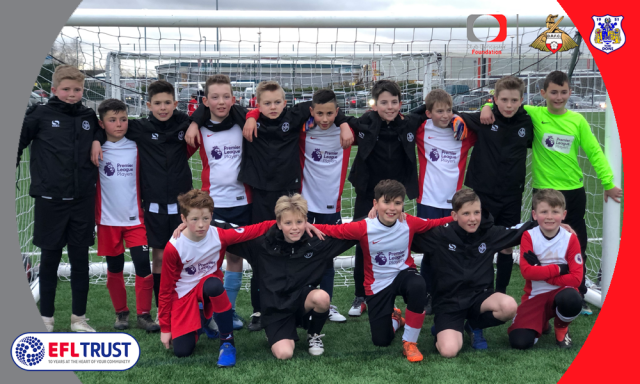 The Key Stage two pupils were proud to represent their schools at the tournament, and enjoyed the chance to represent their schools at the Keepmoat Stadium. Kirk Sandall Juniors made the final in dramatic fashion, having scored with the last kick of their semi final contest against Tranmoor, with penalties looming. The entire event was a huge success, with Gary Brown, PE teacher at Bentley High Street, delighted to have his team take part in the tournament. He said: “The entire event is a fantastic opportunity for all Key Stage two children. "The work done by Club Doncaster Foundation to put this event on is amazing, they continue to deliver high quality sessions not just in the schooling environment but also at outside of school. We are truly grateful for this." The winner of the final will now go on to represent Rovers in the regional finals, which will be held back at the Keepmoat Stadium on Tuesday March 12. The winners of that competition then go on to represent the club and League One north in the National final of the competition, where they will face the winner of the League One south competition.